For several years the Horse Show has provided a platform for the Bahrain royal family – guilty of violently suppressing pro-democracy protests at home – by inviting them as guests of honour; accepting their financial support; displaying Bahrain signage; and naming events after members of the Bahrain royal family, no questions asked. 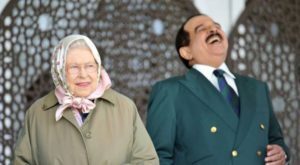 Photographs of the King of Bahrain sat alongside the Queen at the event are trumpeted both within and outside Bahrain as evidence of acceptance by the international community. But the reality is very different from the glossy images. In Bahrain – where pro-democracy activists are jailed for years for sending a tweet – the families of UK-based campaigners are detained on the day of the event and told to call their relatives to call off any protests. We want to hold Land Rover, Rolex and HPower to account for refusing to treat the infringement of human rights and civil liberties as a serious crime. During the 2017 Royal Windsor Horse Show, Bahraini Security Officers snatched banners out of the peaceful protesters hands within the showgrounds; simultaneously, they detained, interrogated and threatened protesters family members who resided in Bahrain. Bahrain Institute for Rights and Democracy (BIRD) is a London-based NGO which provides Bahraini victims of human rights abuses with support, resources and helps them obtain justice.